Cariloha is the only retailer in the world selling exclusively clothing, bedding and bath goods made from bamboo. SANDY, UTAH – Not only will visitors to Cariloha find an entire store experience that revolves completely around bamboo-based products, but they’ll also discover a new infusion of chic, eco-smart clothing styles for men and women, which include button-front shirts, Slub-Jersey polos, dresses, tanks, shorts, wraps, skirts and more all made from unique bamboo-fabric blends. The entire bamboo clothing style line is made exclusively for Cariloha using new material blends and weaves that are on the forefront of the bamboo market. Lush-fabric lovers will notice that Cariloha’s new styles feature all-organic blends, specifically cotton and bamboo, which are recognizably soft and carve a niche in versatile material blends that aren’t typically scene in the fashion industry today. Anyone in the textiles industry who uses bamboo as their chief fabric component usually doesn’t go beyond T-shirts these days. The general public can now get a wide variety of today’s popular clothing styles with all the benefits of bamboo found in Cariloha’s bamboo-soft clothing styles. 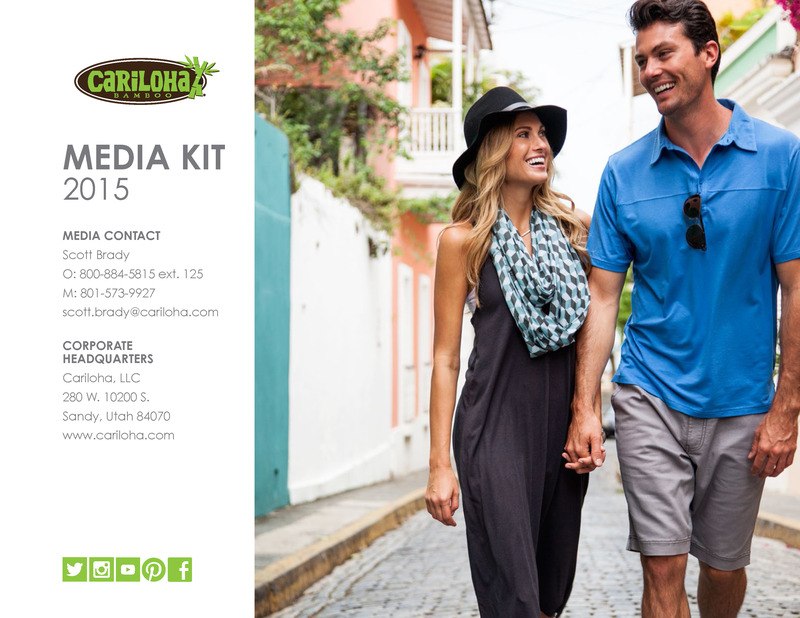 Fans of the bamboo clothing styles can expect new additions to Cariloha’s line approximately twice per year. Currently, the clothing line makes up about 25 percent of the Cariloha store’s product mix and takes up about the same amount of retail space in a typical 1,000-square-foot retail store. Enhanced tailoring, thinner cuts on shorts thighs and button-front shirt sleeves. Custom-pocket bagging, printed with Cariloha bamboo icon on shorts, and custom front and pocket buttons with etched-in Cariloha name on shirts. Custom Cariloha tag on interior waistline with bamboo-soft branding tag on shorts and skirts. Custom, green Cariloha interior waistline piping and belt loop on shorts. See and download lifestyle pictures of Cariloha’s Bamboo Clothing Style line. For more pictures, please contact Scott Brady (contact information below). Established in 2007, Cariloha is the only retailer in the world to provide an entire store experience that’s completely outfit with merchandise made of bamboo. The product line features an exclusive collection of apparel, accessories, home décor, bedding and bath goods and more all made from bamboo. Cariloha’s soft, breezy bamboo goods were first seen out of three, full stores in Ocho Rios, Jamaica; Cozumel, Mexico; and St. Thomas, USVI. Since the first three stores in 2008, Cariloha has already opened stores in nine countries and growing. Cariloha has quickly become one of the fastest-growing merchants promoted on board Carnival, Celebrity, Disney, Princess, Royal Caribbean and Norwegian Cruise Lines. Today, thanks to an ever-growing, rich supply of bamboo, Cariloha continues to offer an exclusive collection of apparel, accessories, home décor, bed and bath sets and more all enjoying the strength, soft touch, and green ‘footprint’ of this renewable resource.